And I know those words are truth, although I really don’t know a whole lot more. I grew up in Hog-happy Arkansas and loved game-day Saturdays as much as the next kid. Going to Fayetteville to a game was like making a pilgrimage, even if I forgot my suitcase and had to wear my mother’s nightgown to sleep in and an outfit I didn’t like for the whole weekend. But as a would-be college student, I deliberately chose a school with no football team and no Greek system. I was going to be an intellectual and live in New York and write poetry and read philosophy and go to foreign films, and I had no time for football or social frivolities. So when I heard the stories about my grandfather, Bill Walton, I confess I didn’t really pay proper attention. There was a former player of his who lived in the small town where I went to college. He and his wife invited me to dinner once and told me about how Coach Walton and the Bear would talk on the phone during World War II, both of them in the Navy, Coach Bryant calling to discuss plays because after he came back from overseas he coached the Pre-Flight team in North Carolina. 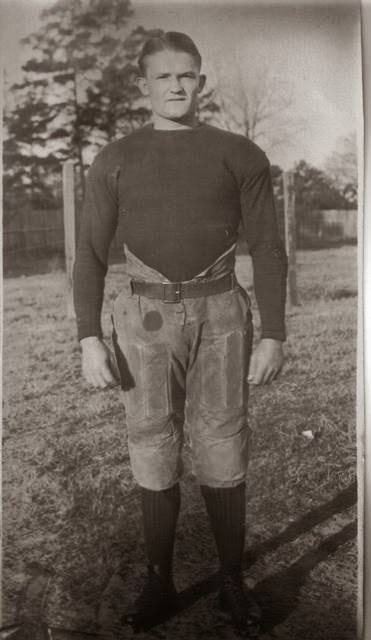 My grandfather had been a successful coach and athletic director at Ouachita Baptist College in Arkadelphia, Arkansas. In his obituary from 1963, the president of Ouachita told the story of how, if Coach Walton had waited to be called up, he could have saved his position, but the coach decided to enlist, knowing his job would not be there when he returned. He came back to Arkadelphia with his family and became an insurance salesman and a huge booster for the college, but his coaching days were over. I barely remember him. In fact, I can say that I have a feeling more than a visual memory, a sense of smiling, playful, gentle kindness in this man who died just after I turned three, and just before my sister was born. When I moved to Alabama, one of my cousins reminded me—“you’ll be fine there. Your grandfather was Bear Bryant’s first coach in Fordyce, Arkansas.” Eventually I thought to look things up on the internet. The dates match up: Bill Walton was definitely a coach when Bear Bryant was in junior high school. By the time Bear’s 1930 Fordyce Redbugs had a perfect season and won the state championship, however, Bill Walton had been enticed to coach at El Dorado high school. I’m pretty sure the presence of my grandmother’s sister and her husband in El Dorado helped sway him. He’d had a very good run for four years in Fordyce, with a 46-8-2 record; they named the field after him there, as they’d later name the gymnasium after him at Ouachita. Back in 1973 when he was inducted into the Arkansas Sports Hall of Fame, my mother accepted the award on his behalf. At the ceremony she gave a short speech, in which she said of her father that he was a “belligerent humanitarian” who wanted to help when there was a need but “heaven help anyone who tried to praise him for it.” In a couple of weeks he’ll be honored again when he is inducted into the Dallas County Sports Hall of Fame in the Dallas County Museum in Fordyce. I also asked one of the organizers of the Hall of Fame if he knew of any sources that connect Bill Walton and Paul Bryant. He wrote back: "From our research of records we have on hand, we determined that Bill Walton did indeed coach Paul 'Bear' Bryant on the Fordyce Redbug football team. Bryant was rather large for his age, so as a ninth grader, he played on the senior high team, which was coached by Coach Walton." The Bryant biographies I’ve seen don’t mention my grandfather. I’m not sure why. Maybe there just wasn’t anybody around to tell it. If there’s more to know, I’d like to know it. Finally, though, I suppose I’m more interested in uncovering the history of this feisty little man who coached greats in football and baseball and died too soon than I am in knowing more about Bear Bryant. Bryant is my way in, a path leading back to the small towns of Arkansas where my family members had lives I know only in fragments. Mary, I'm so sorry I'm just seeing these comments! I'm so pleased to hear that you are writing about Bill Walton for the Dalls County Sports Hall of Fame. My mother was Dodie Walton Horne. I'll need to check on his birth and death dates but will get those to you soon. If you need to private message me on Facebook, that's another way to be in touch.